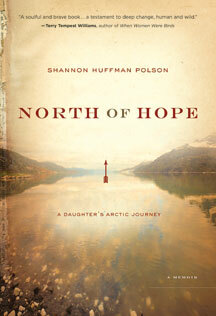 North of Hope: A Daughter's Arctic Journey, is Polson's memoir of adventure, tragedy, family and faith. "An enthralling story of loss, courage and redemption told by a gifted, original and brave new voice." "This is no ordinary memoir. To read it is to be changed." - Jeanne Murray Walker, author of New Tracks, Night Falling. "Daring, perceptive and eloquent…Polson’s writing is clear and forceful. Like all true pilgrimages, this one is challenging, and well worth taking." 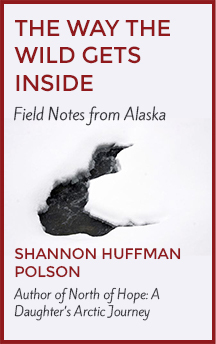 A series of essays about wild Alaska and the beautiful and charged relationship between humans and the wild. I recount an encounter with a grizzly bear in Alaska's far northern Arctic, and other experiences in my home state. May I send you the first chapter of North of Hope and occasional updates? Most recent publication: my short story "Brown Bird" appears in the veterans' fiction anthology The Road Ahead. I hope you'll enjoy.